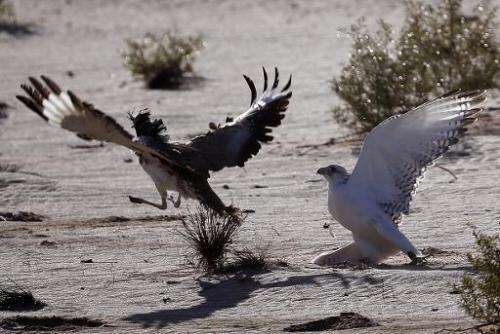 Pakistani authorities are finalising arrangements for a Saudi prince to visit its southwestern desert region to hunt the Houbara bustard, a bird supposedly protected by law, officials said Monday. 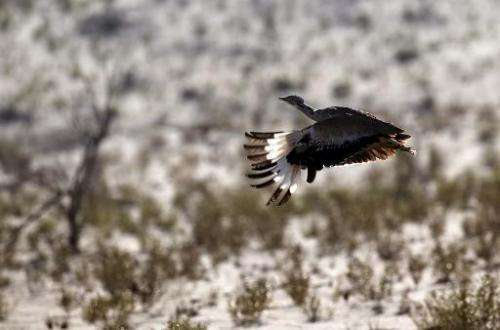 An advance party has already been reached the Yak Much desert in the province of Baluchistan along with falcons which will be used to catch the bustard, officials said. Saudi Prince Fahd bin Sultan bin Abdulaziz is expected to join the group in coming days. He led a hunting party to Baluchistan last year that officials said killed more than 2,000 bustards. The birds are listed as "vulnerable" and declining in numbers by the International Union for Conservation of Nature's "Red List" of threatened species. Hunting them is banned in Pakistan. But authorities issue special permits to wealthy visitors from Arab countries. Permit holders are in theory restricted to hunting a maximum of 100 of the protected birds over 10 days, but only in certain areas. Saifullah Zehri, district forest officer for wildlife in Chagai district of which Yak Much is a part, told AFP the advance party arrived on Sunday in a C-130 transport plane. "They were fully equipped and had all the material which is required for bird hunting," Zehri said. Arab sheikhs are known as enthusiastic hunters, travelling to Pakistan each year to hunt the bird using the traditional Arabian method. They arrive by private jets from the United Arab Emirates, Saudi Arabia and Kuwait. According to conservative estimates, between 500,000 and a million birds of all species migrate through Pakistan each year—flying south from Siberia to pass the winter in Central and South Asia.